The Anniversary Song was written by Al Jolson and Saul Chaplin in 1946. It is an adaptation of the 1820 waltz, Waves Of The Danube written by Romanian military band leader and composer - Ion Ivanovic. 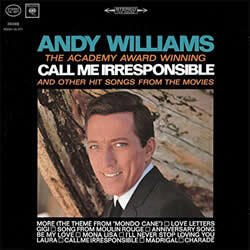 This version by Andy Williams is featured on his album - Call Me Irresponsible. Music: Ebm in 3/4 time at ~128 bpm. Capo on the 1st Fret if playing with the video. "My Darl-ing I love  you   so." "My... Darl-ing I love  you   so." Please Note: When playing Bb6, it may be easier to barre the first fret (strings 1-5). It has no effect on the sound and may be a little more comfortable. C9 is a great chord to learn - with practice, it is very easy to play and you will find yourself using it time and time again to 'spice' things up. Born: Howard Andrew Williams on Dec 3, 1927 at Wall Lake, Iowa, United States. Died: Sept 25, 2012 at Branson, Missouri, United States - aged 84. 1963, 1966 and 1967- Andy Williams Show - won 3 Emmy Awards for Outstanding Variety Series . 6 Grammy Nominations from 1959 - 1967. 2008 - Society of Singers Lifetime Achievement Award. Star on the Hollywood Walk of Fame. Starred in 8 Films from 1944 - 2009. Recorded 43 Studio albums, 2 live albums, 89 singles, with songs included in numerous compilation albums. Andy Williams chords and lyrics are property and copyright of their owners. "Anniversary Song" chords and lyrics are provided for educational purposes and personal use only.